The Comprehensive Economic Cooperation Agreement (CECA) between India and Singapore was signed on 29th June, 2005 by the Prime Minister Mr. Manmohan Singh and H.E. Mr. Lee Hsien Loong, Prime Minister of Singapore. The CECA has become operational with effect from 1-8-2005. It was the first comprehensive trade agreement India signed with any trade partner. It was also Singapore's first comprehensive economic pact with a South Asian country. 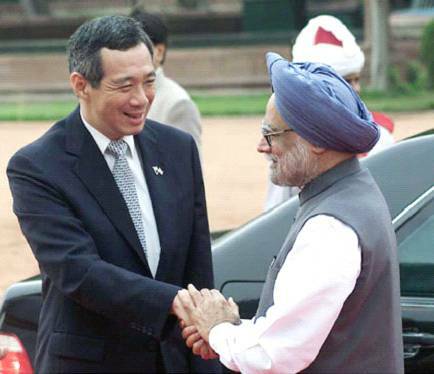 Prime Minister of Singapore, Mr. Lee Hsein Loong is received by Prime Minister Dr. Manmohan Singh during the Ceremonial Reception in New Delhi on June 29, 2005. 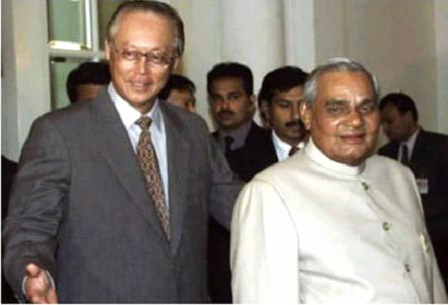 The idea for establishing a CECA between India and Singapore first came up formally in a meeting between then Prime Minister of Singapore Mr. Goh Chok Tong and then Prime Minister of India Mr. Atal Bihari Vajpayee in Singapore on 8 April, 2002. A Joint Study Group (JSG) was established after this meeting between the Prime Ministers to study the benefits of a CECA. The Group was Co- Chaired by Mr. Lim Chin Beng, Member Public Services Commission, and Dr. Rakesh Mohan, the then Deputy Governor of the Reserve Bank of India. The JSG identified major areas of economic cooperation and recommended abroad outline for the comprehensive agreement. Following the completion of the JSG report, a Declaration of Intent was signed on 8 April, 2003 by BG (NS) George Yeo, then Minister for Trade and Industry, Singapore, and Mr. Arun Jaitley, then Minister for Commerce and Industry, India. On 27th May 2003, the relevant ministries for the two governments began negotiations on the details of the agreement. After 13 rounds of formal negotiation, the two countries finally concluded the CECA. India-Singapore CECA has been notified at the WTO on 3rd May 2007 under GATT Article XXIV and GATS Article V. The agreement provides for a review mechanism that allows both sides to update and improve the agreement to maintain its relevance to businesses. India-Singapore CECA has been reviewed once and the first round of review was concluded on 1st October 2007. The key outcomes of the first review concluded in 2007. The issues addressed during the review included expansion of coverage of tariff concessions, implementation of MRAs, facilitation of movement of professionals, expanding market access to financial services, a "Special Scheme for Registration of Generic Medicinal Products" for India and furthering IPR cooperation. At a Ministerial level meeting in New Delhi in 2008 the road map for the future, subsequent to the implementation of CECA kept the target to double India-Singapore trade to S$ 50 billion by 2012. This road map also visualised a joint study to examine the feasibility of funding of infrastructure development of projects in India including the feasibility of setting up of a fund in Singapore by the India-Infrastructure Finance Corporation. Another focus area identified at this meeting was to encourage more people flow by way of increasing two way flows of tourists, businessmen and professionals, setting up of educational institutions such as IIT by India in Singapore and Institute of Technical Education by Singapore in India. Shri Anand Sharma, Union Minister of Commerce and Industry, and Mr Lim Hng Kiang, Minister for Trade and Industry, Singapore, launched the 2nd Review of the India-Singapore Comprehensive Economic Cooperation Agreement (CECA), on 11th May, 2010. The Ministers also reviewed India-Singapore bilateral trade and investment and agreed to further strengthen these linkages through continued support and facilitation to the industry and businesses. 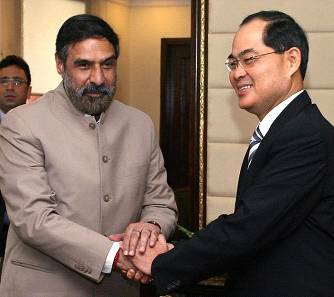 Mr. Lim Hng Kiang (right), Minister for Trade and Industry, Singapore, and Mr. Anand Sharma, Minister of Commerce and Industry, on 11th May 2010 at New Delhi. The India - Singapore CECA 2nd Review Process is currently in progress.